Our history of beautifully designed custom houses in the Mooresville, NC area speaks for itself. Custom Houses in Mooresville & Lake Norman – At Chad Goodin Signature Homes, we do more than build custom houses; we build dreams. That is our motto, and we have spent over 30 years proving that to our Mooresville, NC clients. Our history of beautifully designed custom houses speaks for itself. We are dedicated to giving you the home you’ve always wanted, from hardware to floor plan and everything in between. If you have a custom house in mind, let us turn that dream into a reality. We can build houses of any size, from small & cozy to large & luxury. 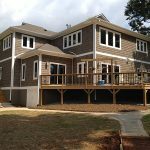 No matter the size of your budget, we can create an amazing new custom home for you. Our astonishing custom houses are made possible through the many partners and relationships we have developed through the years. From design to completion, every aspect of the project will be catered to your personality, desires, and style. Even if you only have a simple vision of your dream house, there is no better place to start than with us at Chad Goodin Signature Homes. We can help you fully form every aspect of your dream house by giving suggestions and offering solutions for everything from large floor plans to small millwork details. We feel the key to success is open communication between ourselves, our clients, and our partners in every step along the way. We believe in providing honest and dependable services to every future custom home owner. Our excellent reputation demonstrates this dedication to you. Our custom houses represent all the good qualities we see in ourselves and our own company. We never settle for anything less than extraordinary. Your satisfaction is our #1 priority, and we know you will love your new custom house! At Chad Goodin Signature Homes, we can build beautiful custom houses in Mooresville, Cornelius, Davidson, Huntersville and the surrounding Lake Norman area of North Carolina.